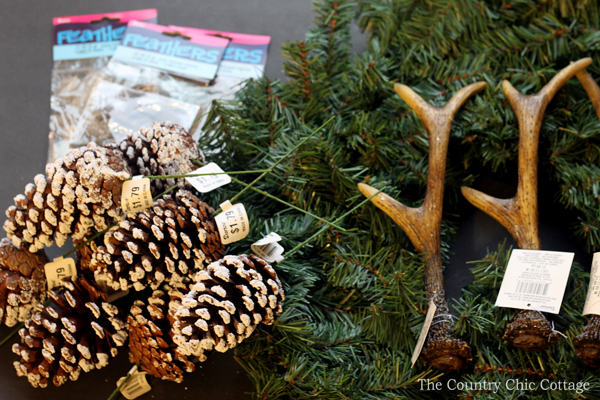 You are here: Home » hot glue crafts » DIY Antler Wreath in 10 minutes! 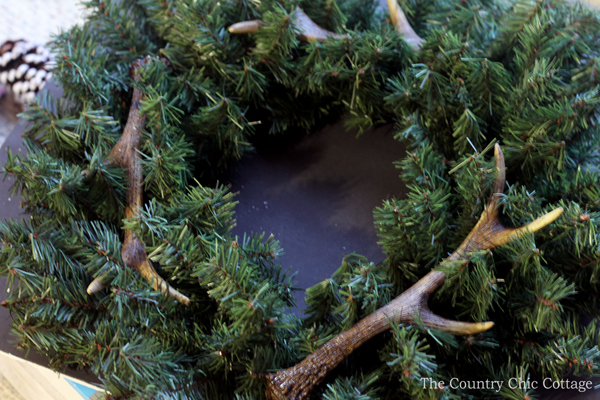 A DIY antler wreath is perfect for the winter months. You can get your supplies and make your own in just minutes. 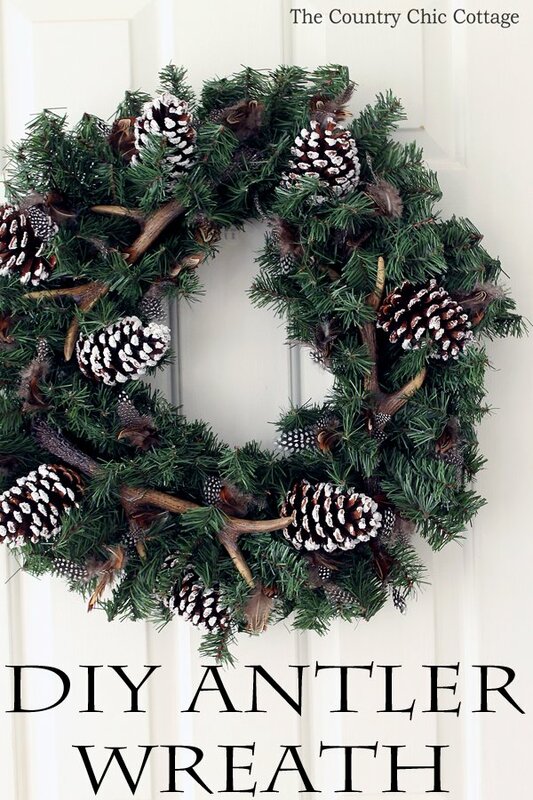 A super quick project that will look great on your door any season of the year. I don’t know about y’all but there is something about the combination of antlers and feathers that makes my heart skip a beat. 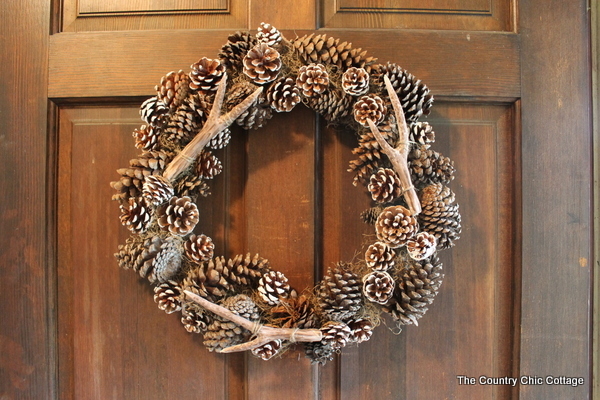 If you are a rustic decor lover, this DIY antler wreath is definitely for you! This post was a part of my paid design team status at Consumer Crafts but I thought I would post it here in case y’all missed it. My wreath was really smashed from shipping so the first thing I did was to reshape the wreath. I then wired on the deer antlers using some floral wire. I used two pieces of floral wire per antler. I then used the wire that was on the pine cones to wire those into place. I ended up using eight of the pine cones. Everything was placed randomly around the wreath. I then gathered up random bunches of all three types of feathers. I used hot glue to secure them in place randomly around the wreath. I ended up using almost the entire package of all three types of feathers. 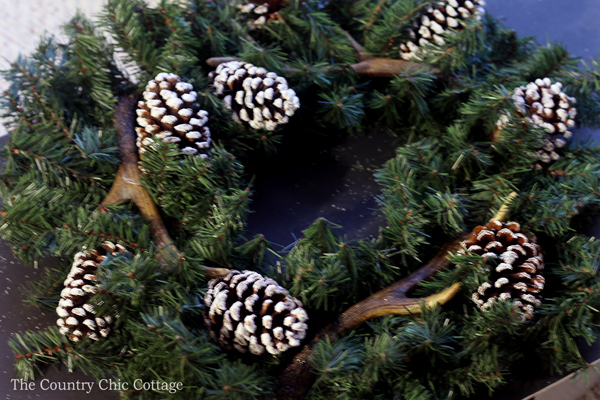 Fill in your wreath with the feathers until you are happy with your new DIY antler wreath. 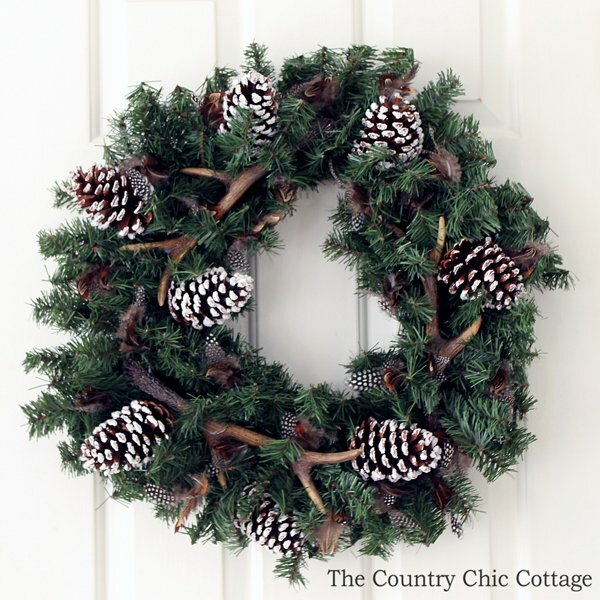 Then just hang it on your door for a gorgeous rustic addition to your decor this winter. TIP: Try removing any glue strings from the hot glue with a hair dryer. 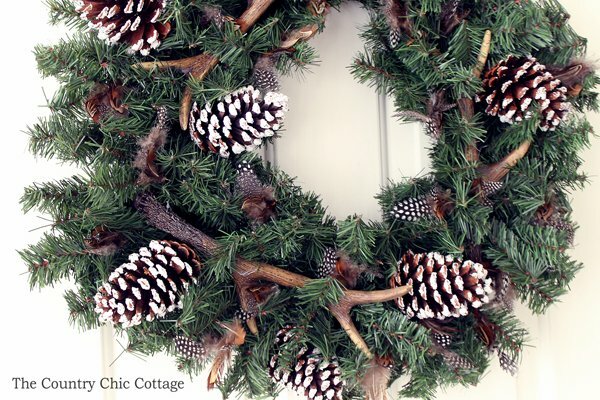 Love this wreath but don’t want to buy the antlers? Click here to see how I made the antlers below from clay! Love it Angie! Pine cones, antlers and feathers are my favorites! This is really neat! I have loved seeing antlers become a big decorating trend recently, especially during Christmas. This is a really cute and different way to use them for any season. Thanks for sharing! I’ve seen “ready made” antler wreaths that were super expensive and not nearly as nice as the one you made! Thanks for the tips on how to create this on our own – will have to give it a try. This is so awesome! My husband would love this. Thank you for sharing on Love the Everyday! I love this! It’s perfect for those winter months after Christmas. What a cute idea for the winter months! I just love it! Thanks so much for sharing at Celebrate it!